The achievements of Gleannloch Farms Arabian Stud, its owners, trainers and horses are the stuff of legend amongst admirers and collectors of Arabian horses around the world. Douglas B. and Margaret Marshall bred champions for 35 years with the extraordinary skills and support of Tom and Rhita McNair. They went on to have a powerful influence that lasts until today, as evidenced by countless world and international champions that trace to horses bred by Gleannloch. *Morafic came to Gleannloch through a remarkable set of circumstances. The stables were well stocked with many winning horses, but still the Marshalls were tireless in their search for suitable Arabian horses to enhance their breeding program. In 1964, Doug and Margaret were on a wide-ranging horse-scouting trip to the Middle East and had already spent nearly a month in Jordan, Syria, Lebanon, Iraq and Saudi Arabia before Tom and Rhita McNair joined them in Egypt. It is noteworthy that even before they arrived in Egypt, the reputation of *Morafic was well known to them. This stallion was a source of national pride who had already sired 30-40 daughters and a dozen sons. Rhita continued: “The more times we saw *Morafic, and what he had produced, the more we knew that this was the horse we needed in order to infuse this particular type and quality into the Gleannloch herd.” The Marshalls and McNairs saw the quality of foals that *Morafic and some of the other stallions they wished to import and were convinced of their importance. However, it took a year of complex negotiations to bring the arrangement to fruition. The officials at the E.A.O. were most reluctant to part with him and were it not for the respect in which the Marshalls were held in the Middle East, it is extremely doubtful if they would have let him leave. Doug described *Morafic as “the sort of horse that you try to breed all your life, and maybe you will and maybe you won’t.” Eventually, the E.A.O. officials were persuaded, and through *Morafic a remarkable Egyptian Arabian breeding program began at Gleannloch. *Morafic sired 30 U.S. and Canadian National winners. He was the grandsire of 50 National winners and the great grandsire of 29 National winners and the great-great-grandsire of 11 National winners according to data compiled in 1986! The influence of his sire line is still dominant around the globe to this day. In the days before Gleannloch focused solely on Egyptian Arabians, one of their most famous horses was Surf, a grey stallion foaled in 1955. The Arabian horse has always been known for its versatility and during Surf’s days in the show ring, the ability to perform across many classes was a highly desirable characteristic. Surf could perform brilliantly in many disciplines, including halter, English, western, and trail. Surf was a many-time Grand Champion Stallion and earned the honor of becoming the AHSA Horse of the Year in 1961 and 1962. Celebrities loved to ride this great horse while performing in Houston including Dale Evans and Wayne Newton who rode him during the rodeo. He even played a role in Strauss’s opera, The Gypsy Baron. When the Marshalls decided to take the unprecedented step of concentrating their attentions on breeding Egyptian Arabian horses and sold most of their horses in the 1964 “Sale of Champions,” it is said that there wasn’t a dry eye at Gleannloch when Surf was sold. *Moftakhar was the first Egyptian Arabian horse that Gleannloch owned and he came to them by serendipity. Norman McAnelly, manager of Gleannloch at the time, stopped off in Kansas while returning from a business trip to Washington, DC. Visiting a sale, he noticed that among the farm equipment there were two striking horses, *Moftakhar, a white Arabian stallion, and a purebred Arabian mare. Snapping them up for $1,500 and $1,350, he made the Marshalls very happy! Having raced successfully in Egypt, *Moftakhar was a tremendous performer, highly versatile and fearless. Popular actor of the period, Syrian-born Michael Ansara (1922-2013) who starred as Cochise in the TV show, Broken Arrow, performed a spectacular act where he shot flaming arrows while racing astride *Moftakhar. *Moftakhar undoubtedly helped kindle the Marshalls’ interest in the Arabian horses of Egypt and went on to sire many excellent performance horses in the United States. 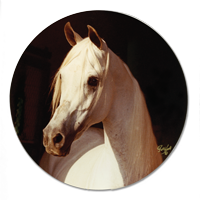 *Sakr was a *Morafic grandson on his mother’s side and his natural talents were most visible in the “park horse” class which showcases an Arabian horse’s natural ability to move with a springy, high-stepping trot in which the front feet seem to float above the ground. *Sakr was equally brilliant in the native costume classes, where horse and rider compete in traditional Arabic raiment. No one present could forget the stunning image of *Sakr performing a hand gallop in his Syrian-made costume with its small multi-colored tassels contrasting with his silvery whiteness. Astride him in full Bedouin costume, Tom McNair and *Sakr made an indelible impression. The convention of the hand gallop in the costume class is the rolling gait of the canter but faster and with a lengthened stride. It must be controlled and “extreme or reckless speed” was penalized. Yet Tom McNair and *Sakr bent the rules and blazed past the other exhibitors, exuberantly traveling just shy of a full-tilt gallop. They were such dynamic crowd-pleasers that if the judges had pinned any other horse with the blue, their audience would have mutinied. 1 * before a horse’s name indicates it was imported into the United States from another country. We wish to thank Arabian Horse World magazine for their great generosity in allowing us to quote from their 1981 interviews with Doug and Margaret Marshall and Tom and Rhita McNair.